Disclaimer: I have decided to write about the controversial topic of genetically modified organisms, GMOs, due to the large amount of misinformation I have seen on the subject. My goal is to educate, so my readers can make informed decisions regarding this topic. I am not trying to persuade people to be pro- or anti-GMO. This is your decision, and, please, make it wisely, since it now affects our every day lives. To understand what genetically modified organisms are, we need to explore some basic science concepts. All life is made up of small building blocks, or units, called cells. Each cell has blueprints, or a set of directions, which tells it how to function, and communicate with the environment. These set of directions are what allows for differentiation, making the cells in your liver different from the cells in your brain. This information is called DNA, and it is the most important aspect of life. DNA has been changing throughout the history of life, creating the vast diversity of living organisms. This means DNA is not static; it is forever evolving. Another name for genetic modification is domestication, an artificial selection process by humans. We have been domesticating and changing the DNA of our food ever since humans started farming. 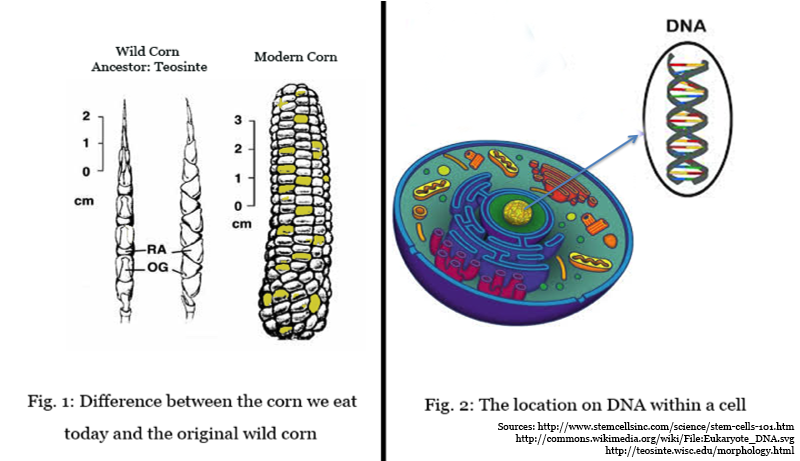 The corn we eat today is not the same corn we ate 8,000 years ago. Originally, corn only had a small handful of edible kernels. Ancient farmers were able to drastically change the size and quantity of the kernels through classical breeding. Classical breeding of plants is very similar to the breeding of show dogs. The plants or dogs with the desired characteristics are mated together to create a new more favorable generation. Instead of creating shorter tails, or longer legs, plant breeding has allowed us to create more nutritious food. Classical breeding is considered natural, but it is still genetically modifying organisms to benefit humans. Using modern technology, we are able to create the same effects as classical breeding, but at a much faster pace, allowing for a rapid acceleration of our food supply. Biotechnology, and our advanced knowledge of DNA, allows us to take small parts of DNA from one organism, and place it into another. By understanding, and being able to read the genetic code, DNA, scientists are able to transfer only the necessary information. It is important to understand that scientists are not just putting random parts of information from one plant or organism into another. The most successful GMOs contain the smallest amount of transplanted information. Additionally, scientists place the new information into specific safe locations in the DNA of the organism they are trying to modify. Humans have always manipulated the environment around them, and genetic manipulation is an unavoidable side effect. The question isn't whether you are for or against GMOs, but where do you draw the line? Are you OK with GMOs that are created through Biotechnology, if they could also be created by years of classical breeding? Or is the technology itself the problem? Thank you for getting something like this out there! So much of what I have read on blogs about GMOs has been really politically charged. It is refreshing to read about the topic in such an understandable and unbiased way. I am glad to hear that I succeeded in provided unbiased information. It is a complicated topic, and generates so much emotion. I think it is folly to believe that just because it is science it is unbiased and I don't agree that your post is unbiased. Did you know that Monsanto has an office in Davis and provides funding to UC Davis for biotechnical research? The professors you learned from where probably receiving grants for Monsanto. Also, there is a difference between "safe" and "healthy." Many primary care doctors working for the UC Davis Medical Center advise their patients to stay away from GMO foods. A lot of papers published in the United States say that GMOs are safe to eat, but they were also published by scientists funded by Monsanto. As someone who has done their own research, I understand the need to prove the hypothesis you originally set. If grants were given out to show that GMOs were safe, and research started showing that they weren't, it would make sense to pull the plug on the research in order to prevent the loss face for you company right? We need to look at papers done by scientists who weren't paid by Monsanto, and there are a few published in Canada. Guess what they suggest? GMOs are not safe your health. I think it is important to not just take the science at face value, but also to evaluate the circumstances in which the science was done. We, as scientists, strive to be the unbiased voice, but we are motivated by our personal curiosities and our need to make a living just like any other person. This is why addressing the social and economic issues surrounding things like genetically modified foods is important, because there is so much to be gained by corporations looking to push GMOs. Additionally, in response made to the statement that biotechnology is just advancing an already natural process, I have to disagree with this entirely. Splicing DNA from a bacteria into a plant to make a pesticide resistant plant is not a natural process and, until you can show me otherwise, I doubt it could be done through traditional breeding. Finally, don't take my tone as hostile. I am your friend, always, but we are scientists and arguing is in our nature, as it should be. Hey! Thanks for responding. I think you made some very good points that should be addressed more often. I liked your comparison between safe and healthy, which we often assume are the same things. You are right about Monsanto's involvement at UCD. This research should not be ignored, but I think you are also right to point out that the origin of the funding should be mentioned. I was trying to point out the role of genetic modification in our food, and that it has been happening long before we started DNA splicing. This is a big topic and I wanted to keep my post simple so I saved topics such as safety, healthy, and ethics for a later post, but they are a vital part of the argument. It sounds like you are against the technology itself. You mentioned creating pesticide resistance through bacterial genes. Would you be ok with using biotechnology to move genes around within the same species? You are right that classical breeding can't create a cross between bacteria and a plant. However, if one plant was found to have developed resistance on its own, would you be OK with using biotechnology to spread this resistance throughout the rest of the species? Or would you prefer this be done with classical breeding, or not at all? I am not trying to tell you that you should eat GMOs. I am not always comfortable with the idea of eating all the new types of GMOs. I wanted to bring up this argument to allow people to understand the technology, the good and the bad. I get frustrated when people become radically anti-GMO without understanding the technology. If everyone took the time to understand the technology and the argument, then voting and incorporating this topic into our everyday life would most likely be very different than it is today. Alana - your thoughts about this are so timely. Just this morning, there was a segment on NPR about this. I'm sending you the link. Food for thought - pun intended. Let me know if the link works.